There are some films you simply take as solid ventures, so well crafted and acted that it is hard to deny the inherent quality of what you are witnessing on screen. Though there may not be anything strictly exceptional about the project overall you understand that it is an impressive accomplishment and a film to be admired if not completely adored. Thus is the case I run into with Captain Phillips, the latest from director Paul Greengrass (United 93, The Bourne Supremancy & Ultimatum) that serves up a take on a true story that was well publicized in national news a few years ago and has Tom Hanks at the center of it. This combination of elements, including the director, are very well set-up to deliver something prestigious and well made. It is that perfect storm of concept and movie star with the added value of a legitimate director behind the wheel to steer it in the right direction that allows Captain Phillips to not necessarily strike you immediately as an impressive film, yet allows it to absolutely live up to the expectations those kinds of factors demand. While I wasn't overly familiar with the true life story of Richard Phillips I'd certainly heard of it and though the trailers didn't look as intriguing as I'd expected (again, due to the reasoning of all the components involved I expected a little something more), but I was game as you can't go wrong with the formula and director Greengrass has the uncommon ability of making a thrilling film from real-life events where we already know how the story will end. He did this with United 93 by tapping into the human element involved and does very much the same here while allowing his lessons learned on the Bourne films to inform his restrained, but tension-inducing action sequences. 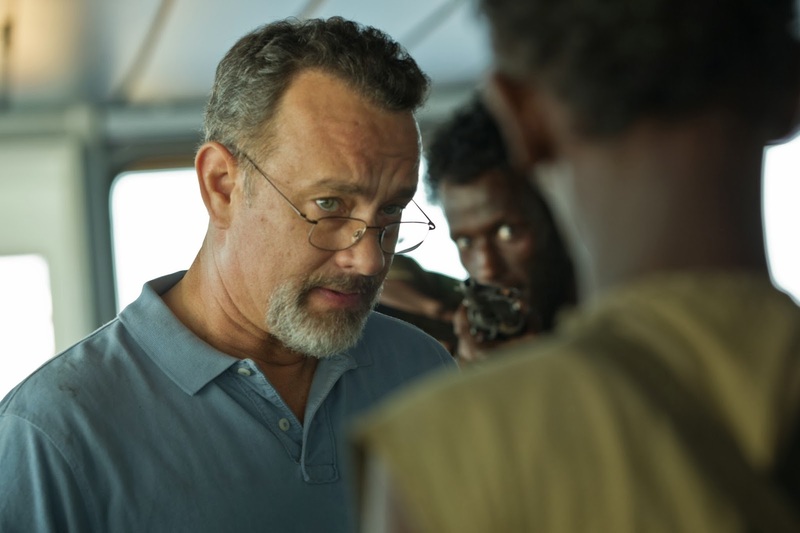 What happens in this film could be broken down to a few very basic scenarios, but Greengrass is able to convey the heightened sense of alert, of fear, and that fear of the unknown into a real character as Hanks' Phillips goes through the tasks required of him from the Somali pirates that have hijacked his ship. Building the engagement of the audience through these set pieces and developing the characters at the same time is an achievement not to be glossed over and Captain Phillips executes this nearly every chance it gets. 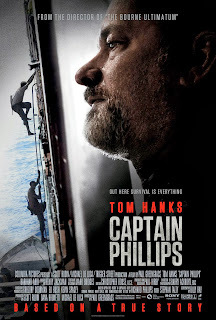 Captain Richard Phillips (Tom Hanks) tries to negotiate with four Somali pirates that have invaded his cargo ship. In 2009 Captain Richard Phillips set out with his crew aboard the U.S. container ship the Maersk Alabama on a course that would take them around the horn of Africa and a mere 145-miles off the Somali coast. There have been some discussions and debates over the accuracy of the story this film and even the book the real Phillips wrote, tells, but that is not for us to consider here. What we are examining is how strong a piece of work this cinematic take on a story that actually occurred in our world is. As quickly as we are introduced to Phillips in his comfortable Virginia home and follow along with he and his wife, Andrea (Catherine Keener in her only scene), as she drives him to the airport we are contrasted with the day-to-day of the Somalians living on the coast that round up crews on what seem like a regular basis to jump at the opportunity of hijacking a ship and gathering money and goods from it. The focus comes to land on Muse aka Skinny (newcomer Barkhad Abdi) as he gathers a three-man crew for his venture as he has his own boat and comes to clearly display a fearlessness of the elements the remainder of his fellow pirates would rather not take a chance on. He enlists the help of his driver, Elmi (Mahat M. Ali), his muscle, Bilal (Barkhad Abdirahman) and the young inexperienced help that wants nothing more than to prove himself, Najee (Faysal Ahmed). Riding out across the rough seas the four armed Somali pirates latch onto the side of the cargo ship and scurry up the side to come face to face with the Captain and a few of his fellow crew members taking them hostage and wanting to know where the rest of the crew is and how much money they have on board. It becomes clear that Phillips and Muse are on a kind of collision course with one another from the very first moment they lock eyes. Abdi's performance is menacing while at the same time eliciting a clear sense of why he feels he has to do what he is doing. We are never made to feel like the Somalians are not the bad guys, we see their humanity in a few scenes, but we understand their place in all of this and that is purely a testament to the layered storytelling Greengrass so expertly conveys within his film. The highlight of the film truly is the performance from Hanks though. It may have been easy to forget over the past few years given his lack of certifiable hits, but Hanks is one of our great living actors and a man who I had the luck of growing up during his prime, his golden age you could say and watching as he delivered performance after performance of just pure greatness; he was untouchable. 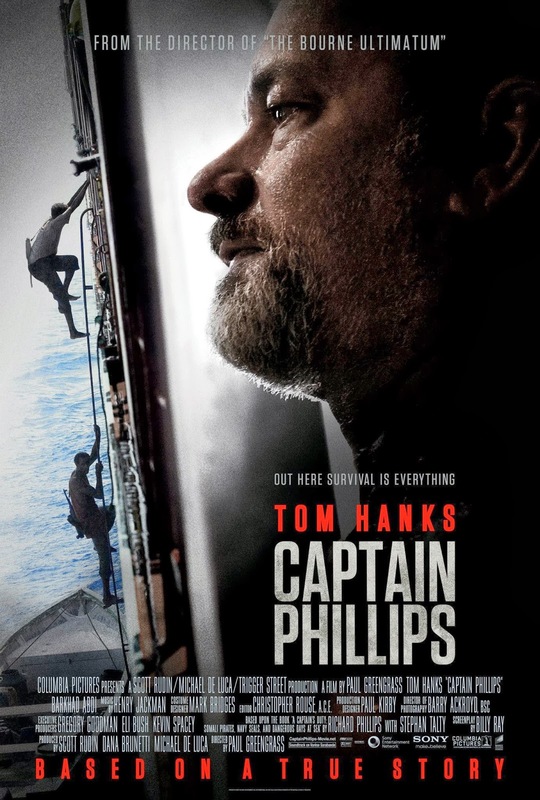 With Captain Phillips, the film is almost as wholly thrilling and engaging because of the fact Hanks has returned to prime form, doing what he does best, as it is purely based on the events it is re-creating (though I did love the underrated Cloud Atlas last year and appreciate Hanks even more for his willingness to take chances). What Hanks does here though is merge himself so well with the environment his character exists in and the time period of his life that allows for a bigger context to understand his Richard Phillips. The Captain is a very strict, by-the-books type of guy though and we see the resistance from his crew, his apathy for extended coffee breaks and their near resentment of his ways that allow them no lax in their duties. It is a credit to Hanks that he is able to make this guy who is in charge and isn't one of the guys that can comfortably sit back and complain about the authoritative figure someone we can believe in and someone that ultimately becomes a hero is the truest sense of the word. He doesn't strive for that kind of reputation, that type of praise yet when the situation calls for it he places what would likely be a rather dull persona from his daily life into the circumstances at hand and almost accidentally becomes this guy that is willing to do what it takes to keep everything as close to on track as possible. We believe his character, we assign him a large amount of intelligence and credibility because of the little nuances Hanks adds in before the action begins and how he turns in the bargaining with Muse that has us on the edge of our seats. It is in the last fifteen minutes or so of the film though that Hanks shows why he is still and always will be one of the greats as he is in top form. When the toll of the violence, the stress, and the anxiety of what is taking place around him comes to a head we see a performance that relays not only the emotional impact of what he's experienced, but the realization of what's been afforded him. 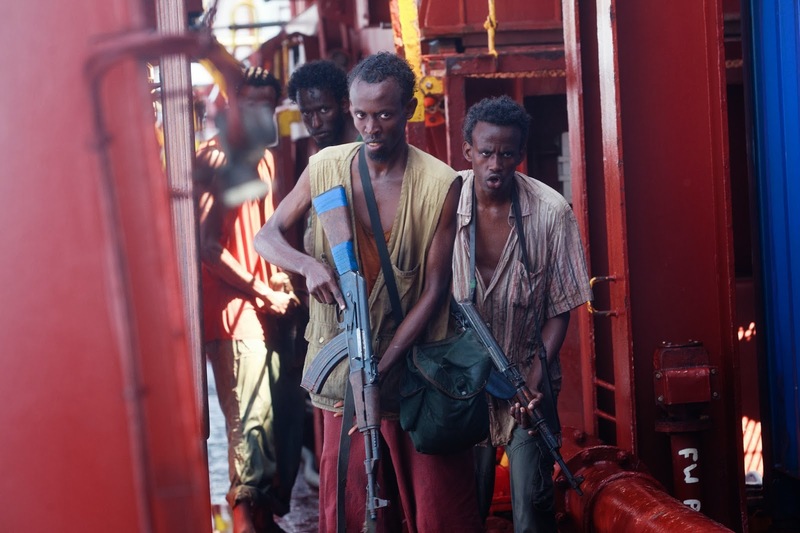 Elmi (Mahat M. Ali), Muse (Barkhad Abdi) and Najee (Faysal Ahmed) in Captain Phillips. In that first scene of the film, which is arguably a little unnecessary and obvious, Phillips and his wife discuss the passing of time, the stages at which each of their kids are currently at, the dangers of the new world around them and ultimately how everything is going to be okay. This recurring theme of believing everything is going to turn out the way it should, the way that will satisfy all parties involved is also a bit heavy-handed, but it is effective. It represents that human nature with which we all depend on to get us through times when it seems the least likely thing that everything will turn out okay. This also re-enforces the, I hate to use the word connection, but more the understanding between Muse and Phillips that develops through the first half of the film and into the moments when the pirates decide to abandon the Maersk and take a lifeboat back to their shores with Phillips at gunpoint as a hostage. Once the film transitions to this section there is a much deeper binding of consideration and almost compassion formed between the two, a look in their glances back and forth that communicates that they see the reasoning for each others actions and to some extent apologize not only for their personal actions, but for what their existence and those actions represent. Thus, the multi-layered elements I mentioned earlier coming into play and affording the audience the opportunity to see a more complex story than just the surface conflict of who we are told are the bad guys kidnapping the well-positioned good guys. It is to Greengrass' credit that he allows things to play out without much hindrance from external elements as Henry Jackman's score is heavily reminiscent of many a Hans Zimmer theme. That the film is two hours and fifteen minutes and consistently keeps us enthralled in the rising tension between not only Phillips and the pirates, but the Navy and the SEALs that parachute down into the ocean to assist in the rescuing of the captain is another testament to its holding power. The film is a well-crafted, technically proficient pulse-pounding action/adventure thriller with a great performance from one of our best actors at the heart of it and not surprisingly, it succeeds on nearly every level. It isn't something I would say is great, but it is an intelligently made movie that entertains and intrigues down to its very least, powerful moment.